Nirvana on College | Mmm, Tasty! I’ve been meaning to post a review of Nirvana for a few weeks now. Rich and I popped by this ‘big sister’ to Spadina’s Red Room a few weeks ago for drinks, and ended up staying for dinner as well. Please excuse the lower quality photos, which are from my cellphone camera. We both really like the Red Room and have been numerous times since we moved to TO in January; it’s a great student hangout with decent food and cheap drinks. I recommend their fried tofu appetizer, which is perfect junk food – it’s tofu, so it can’t be all bad, right? Nirvana actually takes a good chunk of their menu from the Red Room, and the very same fried tofu can be found there. We started with a plate of that, naturally! The rest of the menu is actually a bit more upscale than your typical pub food, offering oysters, curried dishes, creative sandwiches and Mediterranean-inspired dishes like grilled pita with dip. Eclectic would be a good way to describe it. I opted to have their avocado and brie sandwich, which I had been wanting to try for weeks – it’s often featured on their chalkboard A-frame sign outside, so I’d see it taunting me whenever I was walking down that strip of College check this site out. When it arrived, it had large chunks of avocado and thinly sliced brie, topped off with red onion, lettuce, cucumber and tomato and served on fresh bread. I opted to have the grilled potatoes as my side dish. 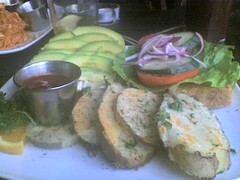 The sandwich was delicious, but the potatoes were a bit bland – they could use a bit of extra seasoning. Rich decided to go for the Pad Thai, which was good, but not authentic. Neither of us would expect to get authentic Pad Thai at a bar, so it’s no surprise here. 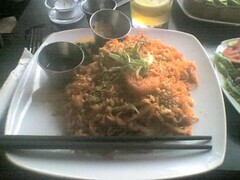 But it is good for what it is: the right balance of ketchup and spice, with good noodles and lots of shrimp and peanuts. The bar menu here is more substantial than the Red Room. Along with the usual beer and coolers, they’ve got a small wine list and a variety of cocktails available. A nice bonus: here they have several Unibroue beers available, including one of my fall favourites, Éphémère. On this evening, though, I decided to try a pint of their sangria, which I’ve been told is good and popular. 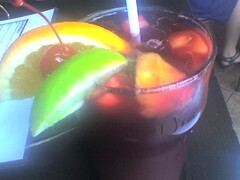 When it arrives, I find myself with a pint glass filled with bright red sangria, fruit, and ice. It’s quite good, although I’ve had better. But like the Pad Thai, you can’t expect perfection here, and I appreciate it for what it is. I also happily order a second one later in the evening. We’ll go back next time we’re in the neighbourhood and wanting a drink or three, and we just might stay for dinner again. Nirvana, 434 College Street, 416-927-8885. Dinner for two with appetizer and drinks, $50. Light(er) Mac & Cheese – Tasty?